It means that no matter who you are, or who you love, where you come from, you’re welcome here. We celebrate diversity of race, economic status, political belief, cultural background, gender identity and sexual orientation. 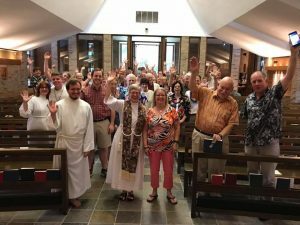 It means that at St. James, we express our faith in the Episcopal tradition—meaning that while our services are rooted in ancient liturgical rituals, we are a faithful and progressive community of followers of Jesus that welcomes your questions and doubts. And it means that sometimes, we mess up. But as a loving community, we strive to recognize each person as a child of God and to love our neighbors as ourselves. Location – Take a Tour!